This door to door service is offered daily from the Arenal Volcano and La Fortuna at 8:30 and 14:30 every day. Originally known as Jeep Boat Jeep, due to difficult access road at the time. It was only possible to make this journey by four-wheel drive vehicles. Today, the roads have improved slightly, but our operation has fully equipped modern buses. Our team of expert drivers, have several years of experience as well the vehicles are subject to regulatory technical review twice a year, in addition to all licenses and policies that Costa Rican law requires for the safe transportation of tourists. 1>Pick up from La Fortuna or your Arenal area hotel at 8:30 AM or 2:30 PM in a comfortable mini-bus with air conditioning. 2>Arrive at the Arenal Lake Dam dock after a 15 to 30-minute ride (depending on the location of your hotel). 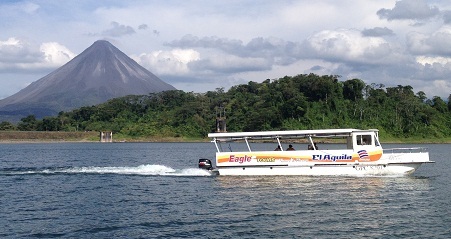 Here, you will board our covered 22-passenger boat and cruise across Lake Arenal in 30 minutes. During your ride, you’ll enjoy great views of the Arenal Volcano and the Monteverde mountain range. 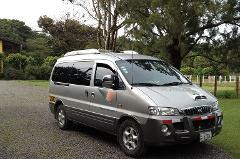 3>Once you reach the Río Chiquito dock, you’ll board a mini-bus (with air conditioning) for a 1.5 hour ride to Monteverde. 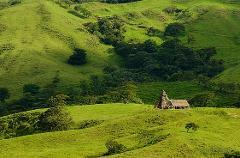 4>Upon arrival in Monteverde, drop off directly at your hotel. Our rate is only $25 usd per person per way, private transfers are available at any time of the day for a cost of $169 usd from 1 to 4 people. Originally known as Jeep Boat Jeep, due to difficult access road at the time. It was only possible to make this journey by four-wheel drive vehicles. Today, the roads have improved slightly, but our operation has fully equipped modern buses. Our team of expert drivers, have several years of experience as well the vehicles are subject to regulatory technical review twice a year, in addition to all licenses and policies that Costa Rican law requires for the safe transportation of tourists. (departure time varies depending on hotel pick-up location). Duration: Approx. 3 hours total. Includes: Ground transport from your hotel to Lake Arenal; 30-minute boat ride on Arenal lake, ground transportation from Lake Arenal to your Hotel in Monteverde. Privated Service available anytime you need it. Rates: from $169.00 (up to 4 people) plus $25 extra person. An extra charge of may apply for pick up or drop off at some hotels that are out of La Fortuna or far from the regular service route.